I don't quite know what my obsession is with women and water. If you come to our house, you will find paintings, bronze statues and now some of Rabi's pieces along this theme. It started sometime in Burkina. This is a photo I was lucky to shoot in northern Burkina near Bani in 2003 with my trusty Nikon N70. I love shooting in black and white, though my dad doesn't understand why I would want to since there is color film. The first shot wasn't quite right, but these gals lined up just right in the second. 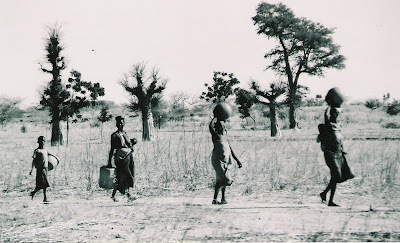 The 3 shorter trees are young baobabs, and the tallest is the shea tree. There are many ways to collect water and girls learn how from a young age. Water can be collected in clay jugs, plastic containers or metal bowls. Babies are brought when mothers fetch the water needed for cooking, cleaning and bathing. Water can be pumped, if a village is lucky to have a well with a working pump. It can be drawn up from a well also, with a bucket attached to a rope. It can be collected from a stream, river or pond. Waterborne illnesses and mosquitoes thrive in open water in Burkina. Most people don't boil their water to kill any parasites because this would require another fuel source. So many children and elders become sick. Malaria is quite common. Being sick is just normal, even though many of the illnesses are preventable. It's just an accepted part of life, like young girls walking an hour for a jug of water.